As I've stated numerous times before, breakfast is a meal I struggle with my two boys over. Their idea of a healthy breakfast is a bowl of cereal if I'm lucky, and if given the choice it's something loaded with sugar like their daddy's box of Lucky Charms. 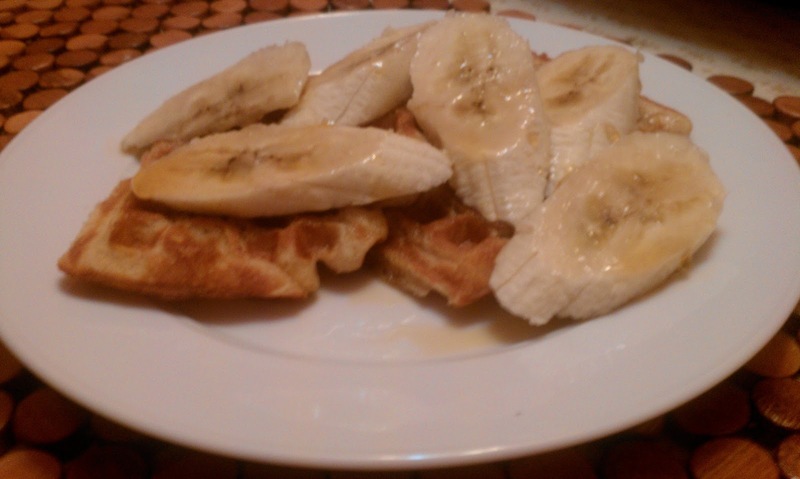 The one dish that they seem to at least taste before dismissing it, is waffles. However, they get tired of having the same thing time and time again, so I am always searching for healthy breakfast options. The May issue of Everyday Food had a recipe for Peanut Butter Waffles, which look nutritious and perfect for my two growing boys. This recipe has 11 ingredients, including the bananas and maple syrup for the topping. I was able to prep this recipe while my 2 year old "helped" me in the kitchen. A couple of comments on the ingredients used in this recipe. There are some products that I will use lesser quality ingredients, however, I'm insistent on using all natural peanut butter. I grew up with my mom going to the local natural food section of our grocery store and grinding the peanuts to make peanut butter (it was the funnest thing ever to watch!). I ended up having to buy bananas twice for this recipe because my boys ate them the first time :) I didn't make any major modifications to this recipe and prepared it as is. My two boys absolutely loved this recipe. I put the leftover waffles in the fridge after breakfast and by lunch they had gone in and eaten all of them. 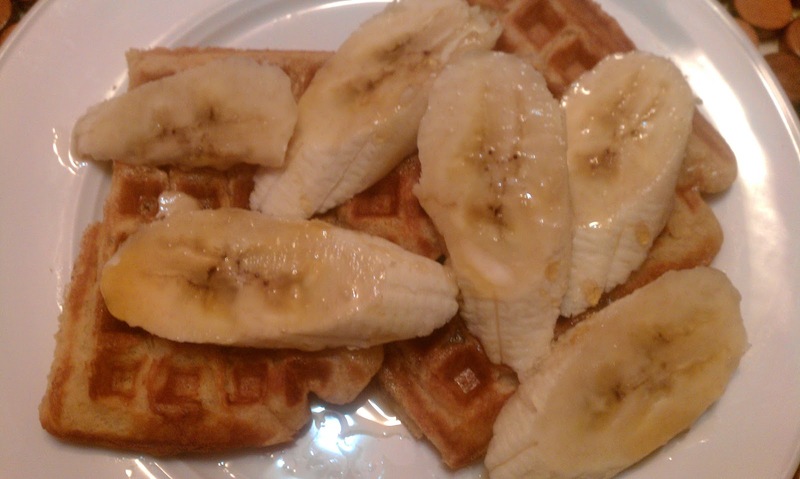 I like that these waffles have extra protein from the peanut butter and the taste is delicious. These are a great way to get a healthy start to your day. For the recipe go to Martha Stewart Living Peanut Butter Waffles. Mmmm. My boys are cereal heads too but luckily all but one boy does pretty well with healthier foods. Thanks for sharing this, I will be trying these soon! I found you by hopping around, I would love it if you came by my neck of the woods. Have a great day! Yum! This looks great! Breakfast is tough for us, too. Especially since my boys are allergic to eggs. There go almost all of the good breakfast foods! Thank goodness they love fresh fruit! Thanks for stopping by my blog, I'm following back. I love new recipes! Thanks for Checkin' it Out! with Dawn, I am now following you back, Twitter as well. Sounds yummy! Just stopping by. Following you from the Luck Wednesday Blog Hop. Would love a visit and follow back on my blog: blog.writerslairbooks.com. Also we are hosting a fabulous iPad 2 giveaway so make sure you enter if you haven't already. Thanks! Nice to meet you! Following you from the Lucky Wednesday Blog Hop!! I just had this for breakfast for the first time last week and LOVED the combination! Btw, Thank You for stopping by my blog. I am following you. See you around very often. Yummy is the perfect word for these. This recipe is definitely going into my favorites!! Stopping by from Blogaholic, just following along. I love finding unique and fun blogs!! Thanks for following along on my blog. @our village My two boys love fruit also, they eat a ton of it! @Olivia It's very yummy, my two boys are big fans! Thank you so much for posting this recipe! My oldest needs protein and we can't get it into her in the morning. Perhaps this will be our new strategy! @Ava Adding peanut butter has been the easiest way to get protein into both of my son's diets. They are both underweight for their age, so I try to pack as much protein and good fats into their diets as I can. Definately going to try it out this weekend ! Am impressed U make your own peanut butter! See if you want to revamp the recipe a bit and submit to my website. will create a " nutrition facts label " and recipe card for it with your name as Recipe creator. Have'nt done much with the website though... badly in need of recipes. No time :( Would love some of your other recipes too. @Sunithi Homemade peanut butter is actually very easy and it lasts up to two months in the fridge. I checked out your website, I will definitely re-work the recipe and get back to you! @Inspired My two boys loved these and they were easy enough that my five year old was able to help measure ingredients and stir.